A man had a very beautiful daughter that was ready for marriage and sent news around town that all the eligible young men should come to compete in a test which would determine who was fit to marry his daughter. 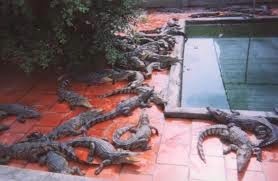 alligators and crocodiles into the pool. Immediately, all the men turned back and started wearing their shirts again. Disappointed, some of them said, ''That's crazy,.lets see who would marry that girl ,no one will'. All of a sudden, they heard a splash in the pool. Everybody watched in amazement as one gentleman waddled across, expertly avoiding the alligators and crocodiles. Finally, he made it to the other side. The rich man could not believe it. He asked the young man to name anything he wanted but the man was still panting uncontrollably. Moral 1: Sometimes, we don’t know what we are capable of doing until we are PUSHED!!. Moral 2: Those seeking to push you into the jaws of alligators and crocodiles may have helped you to reach your promised land!!! Moral 3: Trials are raw materials for Triumphant Testimonies.